Wild Florida Adventures - A listing of our trips. We conduct our tours through the Big Bend area of Florida's Gulf Coast. Our primary location is the Lower Suwannee and Cedar Keys National Wildlife Refuges (NWRs), near Cedar Key, about an hour's drive from Gainesville. Both the Lower Suwannee and Cedar Keys NWRs are managed by the U.S. Fish and Wildlife Service. The Lower Suwannee NWR fronts some 26 miles of the Gulf of Mexico at the southern edge of Florida's Big Bend, encompassing more than 51,000 acres in Levy and Dixie counties. The estuarine portion of the refuge where we conduct our tours brims with wildlife living in a landscape of sweeping salt marshes, intimate tidal creeks, broad bays, and intriguing coastal islands of pine, cedar, and hardwoods. The Cedar Keys NWR is comprised of several islands (within five miles of Cedar Key) in the Gulf of Mexico, ranging in size from one to over 160 acres. The Cedar Keys are famous for their value as nesting grounds for a wide variety of birds, including the White Ibis, Common Egret, Great Blue Heron, Brown Pelican, and Osprey. The refuges are relatively pristine, with tremendous opportunities for picnicking, bird watching, photography, and exploring. 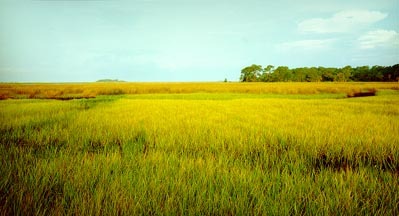 Other sites include the creeks and estuaries around Steinhatchee and Suwannee. In Suwannee there is an excellent and maintained canoe trail through the blackwater swamp and sweetgum forest. 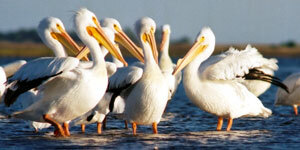 Fall through spring is the best time to view the thousands of ducks and shorebirds that winter on the Nature Coast. Summer sometimes brings rare finds, including the Greater Scaup and White-winged Scoter, as well as more common residents such as the Swallow-tailed Kite, Magnificent Frigatebird and White Pelican. We currently offer tours from the area of Cedar Key south to the Chassahowitzka River. Other destinations include, inland spring fed rivers and streams, such as the Ocklawaha, Rainbow, Silver, and Withlacoochee rivers. Manatee viewing tours are a unique highlight that we offer in the fall and winter months in Citrus County. The lineup changes seasonally, so contact us for more information. Kayak instruction included with all tours. This is our most popular trip. It leaves from Shell Mound near Cedar Key and introduces you to the estuaries and coastal islands of the Lower Suwannee NWR. You may see a wide variety of birds, dolphins, terrapins, and tailing fish. The distance we cover depends on the experience and condition of the group. Designed for beginners and experienced paddlers. Half-day trips throughout the year. Beginning at the beach in Cedar key we kayak through the shallow waters off the pier to Atsena Otie key. We stop at the dock on Atsena Otie for an hike on the improved trails. Interpretive signs are present to provide a historical perspective for the small island. If time a conditions permit we will continue on around Snake Key. This tour is limited to six participants. No special rates apply. Enjoy the beauty of a Nature Coast sunset and the rising full moon from your kayak. This is probably our most romantic trip, great for lovers of all ages. It is leisurely, covering a shorter distance than our other tours. After dark, watch for bioluminescence in the water. With every paddle stroke, you may stir up a swirling galaxy of tiny glowing creatures. Maybe you'll even see dolphins in the moonlight. Great for beginners and experienced paddlers. Sunset/moonrise trips are offered from year-round but are restricted to just prior to the full moon. The town of Suwannee is situated at the mouth of the Suwannee River. Backwater creeks wind through primitive cypress wetlands on the edge of the Lower Suwannee National Wildlife Refuge. Steinhatchee is a complacent fishing community that has retained its pristine natural surroundings and serenity for over a century. 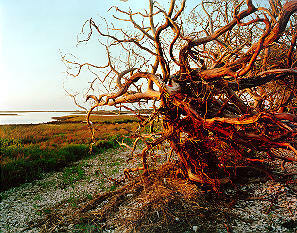 Explore the coastal marshes where the forest meets the Gulf. Sabal palmettos tower above the marsh like sentries of the forest. Steinhatchee is often referred to as "The Best Kept Secret in Florida." Come find out why. The untamed beauty of the wild Waccasassa will take your breath away. A narrow twisting and turning river will take you through a canopy of cypress and hardwood that will embrace your soul. This river leads to a 36,00 acre, limited access preserve at the Gulf of Mexico.